Today’s Le Bella Donna bride is Jennifer! 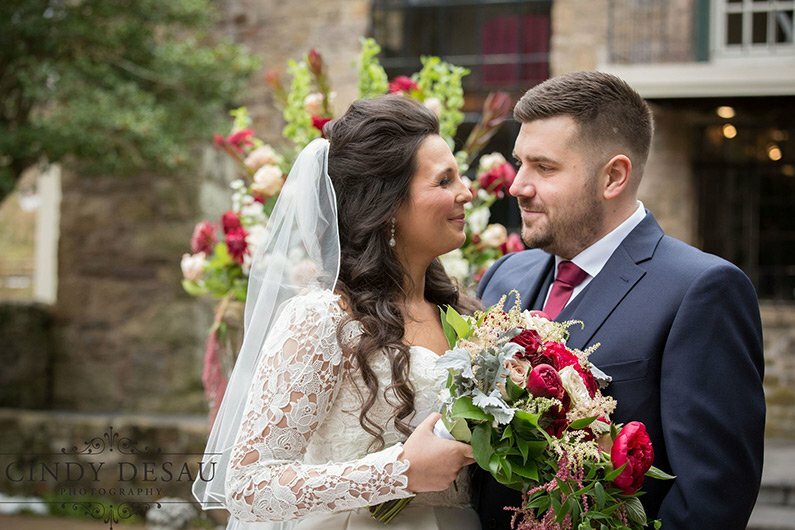 She married her husband Tom in November at Holly Hedge estate in a simply sophisticated pearl mikado gown with a lovely sweetheart neckline. She paired this gorgeous gown with a lace jacket and waterfall veil to complete her elegant look. Jennifer and Tom met in their high school forensic science class and remained friends for six years before they began dating in 2012. The two vacationed in Sea Isle city where Tom first told Jennifer he loved her. Five years later, the couple returned to their favorite vacation spot and Tom proposed! Before she began shopping for her wedding dress, Jennifer already knew exactly what she wanted. She wanted her dress to be classic and have sleeves. Jennifer was not one to dress up often, but wanted her special day to be different. Jennifer’s favorite part of shopping for her dress was spending time with her mother and grandmother. She also enjoyed getting to dress up and feel fancy. As a bride to be, she felt that the experience of shopping for her dress was an emotional one. Jennifer knew for sure that she was having her “yes” moment when she didn’t want to take off the gown! The dress had checked all of her boxes, including ones she didn’t realize she had before trying on the dress. However, her perfect gown was strapless, a bit different from her dream of sleeves. Luckily our consultant Jess was able to help Jennifer pick a beautiful lace jacket to wear over the dress, an option that Jennifer was not even aware of before coming to Le Bella Donna. Besides the usual stress of planning a wedding, Jennifer describes the planning process as “a magical time.” Jennifer and Tom were so in tune during this process that they didn’t have any conflicts and wanted all of the same things for their wedding. Jennifer’s favorite part of her wedding was planning it. She loved planning the little details and says she believes that those details are “what makes or breaks it!” It was an unforgettable moment when she saw the culmination of all her planning. Congratulations Jennifer and Tom! We wish you many years of love and happiness together!